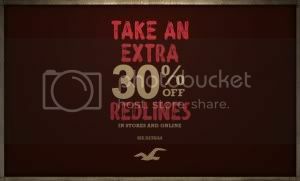 Hollister is taking an additional 30% off all red-line clearance merchandise in-store on online. With the discount, you can get shirts for $6.93 and hoodies for 13.23. Today only, Hollister is offering 19 pairs of Guys and Girls Jeans for just $19 (reg. up to $59.95) AND all Jeans ship for FREE (this offer is not valid in-store)! Today only, Hollister is offering up all Jeans, Joggers, & Pants for just $19 (reg. up to $59.95) AND they ship for FREE on orders of $25 or more. Now through March 2nd, Hollister.com is offering up to 25% off 3 or more items with the promo code 30066 at checkout (or save 20% off 2 items and 15% off 1 item)! Plus, shipping is FREE on $50 orders or get FREE 2-day shipping on qualifying items through ShopRunner – sign up for a FREE 30 day trial here. Today only and online only, Hollister.com is offering up all Shorts for just $15 (reg. up to $49.95!) AND they ship for FREE on orders of $50 or more.